It was a beautiful day to walk the park along the water. The sun was shining and it was nice seeing all the NYC dogs out! We saw our share of retrievers. We have this stereotype that all Retriever owners are happy and friendly but we found out that is not the case. Some looked very angry and almost made us feel sorry for the happy retrievers they were walking! We enjoyed watching the ferries and practicing our photography skills! Unfortunately the Statue of Liberty was still a bit too far away to get a good picture of. My sister had never seen the Statue of Liberty so it was exciting to see her see it for the first time (even though I told her we saw it from our cruise ship a few years ago, apparently she was getting into other things on the cruise when we passed by it). I am told you can get a really good view from the Staten Island Ferry and that's a free ride too. Maybe next time we'll do that. We took a ride on the Sea Glass Carousel. We saw this on the TV Series Younger and thought we would check it out since we had never done it before. To see more about the Sea Glass Carousel, check out my IG story. I bet this would be cool to do at night but we wanted to make sure we were in midtown when it got dark so we could see all the lights up there. We visit Canal Street, China Town, Little Italy, and Union Square. While in Little Italy we had a great meal at an Italian Restaurant called the Grotto. I'm really picky where I eat and won't go into any place that looks like a dive restaurant. This place was pretty nice looking and so that's why we were pretty surprise when they had a very inexpensive lunch menu. We had two spaghetti with bolognese sauce, a salad, chicken marsala, and Chicken milanese for only $14.94 each! What a bargain for NYC! We had fun checking out all the holiday lights and activities. No visit to NYC is complete without a visit to the Macy's flagship store. Did you know it was 9 stories? Don't forget about the Holiday Card Swap that we've been doing for the last few years. The deadline is tomorrow so send us an email now if you want to participate! (www.fairytalesandfitness at gmail dot com). 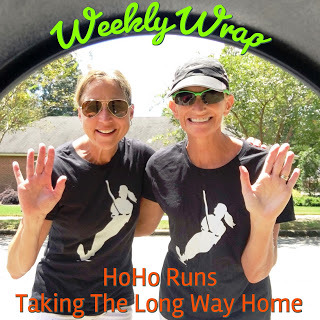 We are linking up with Holly and Wendy for the Weekly Wrap. I wish I would have visited the World Trade Center but to be honest back before 2001, I didn't realize the towers were an iconic piece of New York. When were you there? I was there Wed-fri.
NYC is always so gorgeous during the holidays! The whole city is filled with lights and Christmas decorations and it always puts me in the holiday spirit. I love this time of year but it can be SO very crowded, at least in Midtown. Looks like such a fun time! NYC at Christmas is so pretty..and so much good food- YUM! Yes, we need to spend more time trying more food! I've only been to NYC once, and we had a 4-month old baby in a stroller, so we were limited to what we could see and do LOL I'd love to go back!! Yes, you are due for a NYC trip. Perhaps a future racecation? Disney and NYC are two places where you walk a ton but don't seem to mind! Fun! I haven't been in NYC in December in years, and it was so much fun. We didn't get to Macy's, but it was fun looking at the window displays. I love NYC in December - if it's not too cold! Looks like you had a great time! Oh, the weather was gorgeous this day. It started to rain at night though. Glad you enjoyed my city. The giant ornaments are right by my office. Also the lights the block south. Fun gauntlet to walk with the crowds. You have a fabulous city! How fun that your office is by the Giant ornament! Looks like a really fun trip! I haven't been to NYC during the holiday season in a long time. There is so much to do and see! You'll have to plan a trip soon! What a fun trip to NYC. I've been once with my sister. Twice I've been there just before Thanksgiving and most of the holiday lights were up but not the tree Rockefeller Center. I've always wanted to see it. The carousel sounds cool. I've never heard of it! Thanks for linking. There are actually several carousels in NYC but this one was new to us. How fun! Sounds like you packed a lot into your NYC trip. And that Italian restaurant sounds like a great deal to get all that food for just that much money. Oh my gosh we were so excited about finding that restaurant! Our server reminded us of one of the guys on the Impractical Jokers show! What a neat adventure with your sister! I've never been to NYC but one of these days I'll get there. That tree at Rockefeller Center is incredible, and the star on top, WOW. The tree at Rockefeller center is definitely nice, but there are actually some other trees in the city that are decorated better. The one in the financial district was pretty nice too. It sounds like you had a wonderful time in NYC. We went in September and our son took us on an amazing walking tour. Yes, I remember that. I'd like to take the bike tour over the summer. You definitely packed in a whole lot into 1 day! And yes, you get a good view of Lady Liberty from the Staten Island ferry, we did that a few years ago. I also love the Christmas market in Bryant Park . . .
We spent quite a bit of time watching the skaters in Bryant park. We actually did buy some stuff at the market too! I'm just so jealous. NYC is just some place I want to go visit & soak in all the atmosphere!!! I have never been to NYC. Thanks for the recap, because I loving seeing what fun things there are to do and see. One of these days I'll make it there! One year we went to Radio City Music Hall to see the Rockettes Christmas show. When you go for the first time you should put that on your list! NYC at Christmas! It looks amazing!! I'm glad you both had so much fun! Christmas time in NYC is really something to see!